Content: There’s some violence and (much like the first one) this takes some effort to follow. Not for the reluctant of readers. It’s in the YA (Grades 6-8) section of the bookstore. A few spoilers for the first one, obviously. You’ve been warned. Both Jake and Venn have become increasingly desperate to use the mirror, to make it work right. Jake, in order to find his father. Venn, because he wants to turn back the clock to get his wife back. 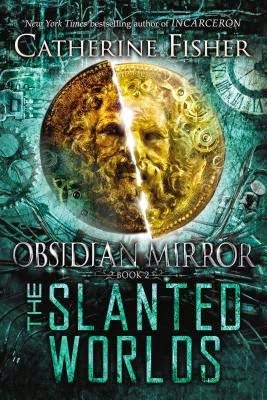 Neither of them know of the outside forces controlling the mirror — that’s a knowledge known intimately to Maskelyne, an old, old time traveler, who may have been the one who invented the mirror — but both are willing to do whatever it takes to keep the mirror safe, and bring back the ones they love. Including involving Summer, the leader of the Shee, the fae-like creatures. I have realized while typing the above that I could recount the plot of the entire book and it probably wouldn’t make any sense to those who haven’t read it. There are other factors, as well: Sarah’s still around, trying to destroy the mirror and rid the world of Janus, and she’s willing to involve the Shee as well. In fact, the Shee is the wild card here: Summer is the chaotic evil here, working toward her own end, but we have no idea what that end it. There’s a lot of wibbly wobbly timey wimey stuff in this book, time looping in and back and forward on itself in incredibly fascinating ways. Jake is the real focus of the book; its his quest to find his father that we follow most closely. It was a good thing to focus on one arm of the conflict, though I did miss having Sarah around. But at the end, I was left wondering: how is this all going to come together in the next book? How are we going to resolve the tension between needing to rescue those trapped in time and the need to destroy the mirror to save the world? I suppose I’m just going to have to read the third one and find out.